A single person earning over €50,000 will be ineligible to apply. FINANCE MINISTER PASCHAL Donohoe has announced details of a new affordable housing scheme. 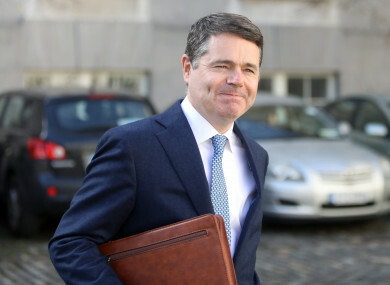 Delivering his budget speech to the Dáil, Donohoe said that a total of €2.3 billion to the housing programme for 2019. In relation to affordable housing, Donohoe said he is increasing the planned funding from €20 million to €89 million. He said that this will facilitate the delivery of around 6,000 affordable homes. Donohoe explained how this will help the average person trying to buy an affordable home. Donohoe also announced that he is allocating €1.25 billion for the delivery of 10,000 new social homes next year. He said these will be delivered through a combination of construction and leasing “bringing to 30,700 the number of new social housing homes provided under the Rebuilding Ireland scheme”. He also announced an extra €121 million for the Housing Assistance Payment in 2019 to provide an additional 16,760 new tenancies in 2019. Email “Donohoe announces details of new affordable housing scheme”. Feedback on “Donohoe announces details of new affordable housing scheme”.